Chapter 10: Chemistry, Bioactivity, and the Structure-Activity Relationship of Cephalotaxine-Type Alkaloids From Cephalotaxus sp. 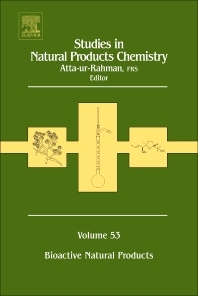 Studies in Natural Products Chemistry, Volume 53, covers the synthesis, testing, and recording of the medicinal properties of natural products, providing cutting-edge accounts of the fascinating developments in the isolation, structure elucidation, synthesis, biosynthesis, and pharmacology of a diverse array of bioactive natural products. Natural products in the plant and animal kingdom offer a huge diversity of chemical structures that are the result of biosynthetic processes that have been modulated over the millennia through genetic effects. With the rapid developments in spectroscopic techniques and accompanying advances in high-throughput screening techniques, it has become possible to isolate and then determine the structures and biological activity of natural products rapidly, thus opening up exciting opportunities in the field of new drug development to the pharmaceutical industry that are discussed and highlighted in this series.